You stand in a dark, smoke-filled room. Lights flicker from all directions, illuminating the crowd of people that surround you. You notice that the mass of individuals consist exclusively of couples. Some are locked in romantic embraces, while others merely tolerate each other with distance. Four women, clad entirely in black, take the stage in front of the crowd. The roar of guitar and clash of drums spread throughout the room, igniting every individual . . .
Love songs come in all shapes and sizes. Some flutter with infatuation, cast in a sanguine, shimmering light, while others lurk with sensuality behind closed doors. One never thinks of love songs as “loud” or “violent”, though. Can the same adoration be communicated with fire and brimstone? 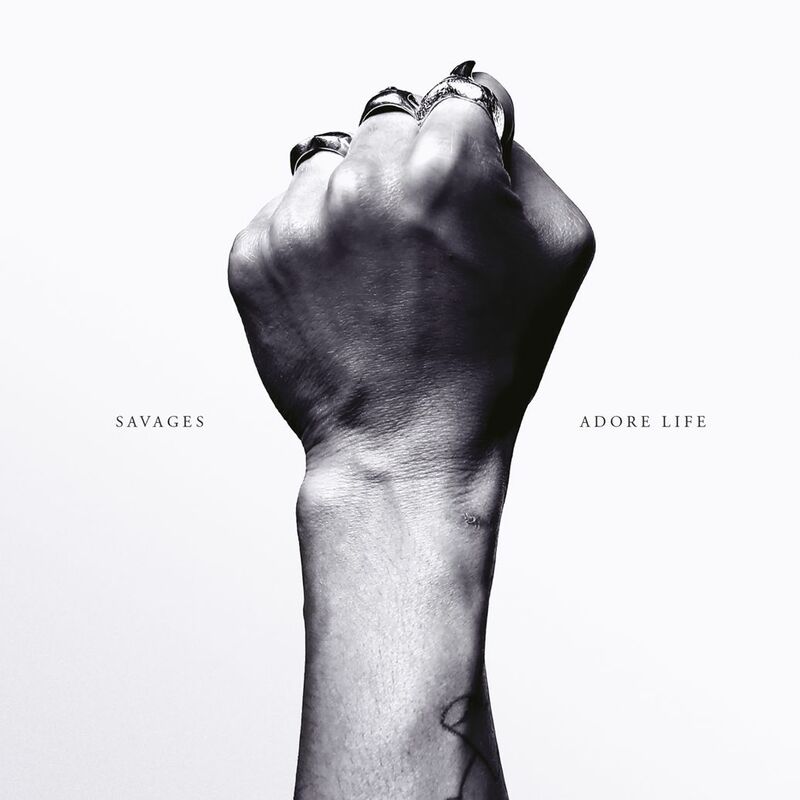 Adore Life is the newest full-length from Savages, a band from London that uses this scorching record to put that inquiry to rest. The four ladies that make up the group possess a rare, powerful cohesion. Fay Milton’s propulsive drum rhythms, Ayse Hassan’s pulsating bass lines, and Gemma Thompson’s soaring guitar riffs meld together in an onslaught of melodic post-punk, while front-woman Jehnny Beth tops off the compositions with her ferociously beautiful voice and dagger-sharp lyrics. The essence of positivity is palpable, but it’s delivered with intensity. Adore Life is human. Adore Life is alive. Most of all, Adore Life is the ideal embodiment of passion in its most fervid, fiery state. It’s a collection of tracks that burn with potent truths. There are artists that flourish in the art of the love song, and there are artists that revel in darkness, but none can transform love into something dark and powerful like Savages can. If you’re seeking melodic, intense post-punk, this album is for you.